Also known as Santa Maria Dell’ Elemosina, this church in Catania is a classic example of Sicilian Baroque style of architecture. Dating back to the 18th century, the design of the church is attributed to the Angelo Italia who changes the orientation of the previous structure that stood on the ground of the church and destroyed in the devastating earthquake of 17th century. The majestic facade was designed by Stefano Ittar and exhibits stunning architectural beauty. The church has two orders; the first one features six tone columns and the second one has four large statues. Six stone columns surmounted by a balustrade. The Immaculate altar followed by a marble balustrade; over which is a marble statue of the Madonna. 18th-century wooden organ and a wooden choir. How popular is Basilica Della Collegiata? People normally club together Teatro Massimo Bellini and A' Piscaria Mercato Del Pesce while planning their visit to Basilica Della Collegiata. 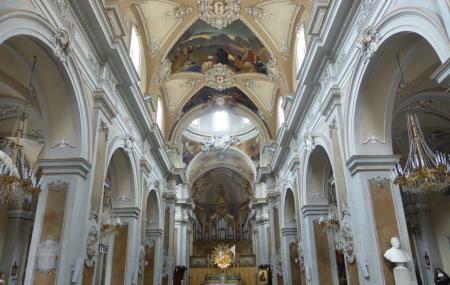 There are so beautiful churches in Italy, but the place is quite beautiful and cut size. The basilica sometimes may use a wedding hall that there are some wedding events in a weekend. Small but beautiful church, especially its exterior building is exquisite.